Govt schools adopt tech in teaching - Augmented Reality, Virtual Reality & Mixed Reality services in Chennai, India. Developed by Hyderabad-based Virtual Raasta, the kits have been deployed in 30 government primary schools in Rajanna Sircilla district after training the teachers. Hyderabad: Not just the corporate schools, even the government schools in the State are adopting new technologies for teaching and learning. 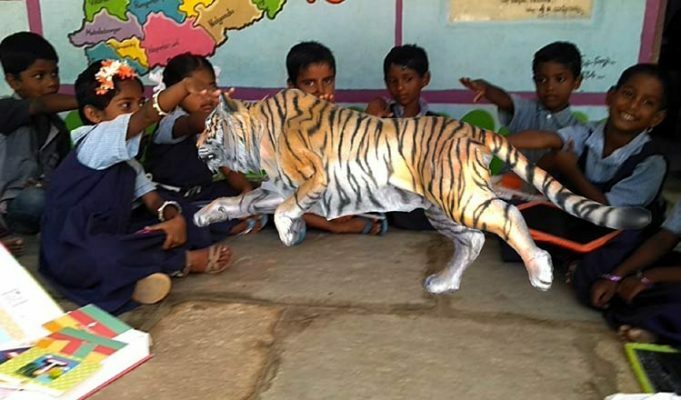 One such technology is the Augmented Reality (AR) Edutainment kits which provides an immersive 3D experience for teaching, learning and engages the students with its interactive features. Using these kits, students can have 360 degrees AR and Virtual Reality (VR) environment experience with the images. It works with a smartphone or projector and an AR app. All that teachers need to do is scan the images on the AR sheet using the app on the smartphone and it becomes augmented reality experience. The kits come with five augmented reality sheets including Arnimals, Professionar, Transporatar, Instrumentar and Shapesar. The Animals kit has 32 augmented reality experiences which help in learning alphabets with different animals. Children can move, drag, rotate, zoom in and out, make them walk, run and jump the 3D image of the animal. Likewise, children can learn the transportation system using 20 augmented reality experiences which comes with the Transporter kit. When the image is scanned through the smartphone, the vehicles come to life and interact with the students and engage them in fun activities like rebuilding the vehicles or go on a trip. Speaking to Telangana Today, Praveen Kumar, a teacher, government primary School in Desaipeta said the kits have been used for 10 days before Dasara vacation. “The kits are helping them learn the subjects with ease,” Kumar said. Prem Kumar Vislawath, founder, Virtual Raasta said the kits help in increasing child’s retention power and makes the learning process easier, fun and interactive. “We have developed content for children between two years and eight years presently and intend to make content in VR and AR till class XII,” he said.